Are you tired convincing your manager that you REALLY need the tool from your dreams to be more productive in your daily work? Are you jealous of all these lucky ones that have “All Access” to the backstage area? 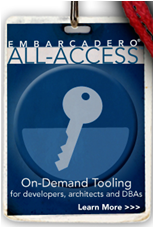 Embarcadero ALL-ACCESS On-Demand Tooling is going to change it forever! All you need is your “All-Access” Pass and you have it all! Any time, any place! 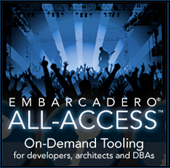 All-Access™ Pass is a license key that unlocks all tools in the respective Embarcadero All-Access tier. There are four levels: Bronze, Silver, Gold, and Platinum. Software systems are typically built around databases in the form of applications, one could say. It does not matter if you are an architect, developer, tester or database administrator or if you want to create a database structure and populate it with some data or just want to create an application to access an existing database. There is a different software tool for you to use. You can model your database in ER/Studio and manage it with DBArtisan. With Delphi or JBuilder you can build your database application, author SQL with RapidSQL and put into production with Change Manager, Performance Center and DB Optimizer. Like a gardener needs a tool chest with all the tools to take care of a garden that he keeps in a shed, likewise an IT professional needs a chest of software tools! “All-Access” gives you access to all tools that you need. You can either install a tool of your choice in a traditional way or you can use “InstantOn” to simply click-and-run the selected tool on-demand, either locally or over your network, without full installation on your local machine. InstantOn saves valuable time by allowing quick access to tools, even in locked-down desktop environments where installing software is problematic. You can even run your tools from a USB stick without any installation! All-Access means ultra-flexible licensing options where you can have “Workstation”, “Network Named”, “Network Concurrent” licenses or even licenses on your usb stick. Network licensing mode indicates that the Client communicates with All-Access Server to run the available products. 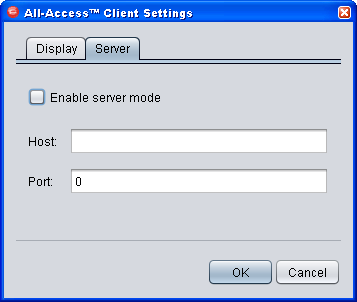 Workstation mode indicates that the Client runs independent of All-Access Server. USB mode indicates that the Client runs from a portable USB device, independent of All-Access Server. This is a temporary mode and has a fixed expiry date. All-Access Client is the interface through which you launch Embarcadero products. It provides a single gateway to all of the applications that have been downloaded and stored in the repository directory. You can have multiple versions of every product available for you to use. You can decide which version of a product you want to run. You can have a product installed locally in a traditional way and you can also run it instantly without installation. Through the All-Access client you have easy access to any version of a product. You can “Rewind” and “Fast Forward” to any unlocked version. That’s the ultimate product versioning! The key part of All-Access Pass is annually renewable All-Access membership which includes support, maintenance including all product updates and upgrades to any unlocked product, and access to any new products that may be released and added to All-Access tiers. 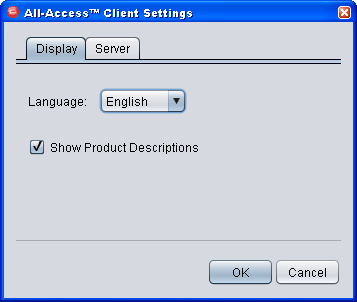 All-Access provides very flexible licensing modes, including “Workstation”, “Network Named”, and “Network Concurrent”. In the Network licensing mode the All-Access client communicates with All-Access Server to run the available products. If there are a number of All-Access users in your organization, you can install the All-Access Server on a selected machine in your local area network and just give your colleagues All-Access Server URL. 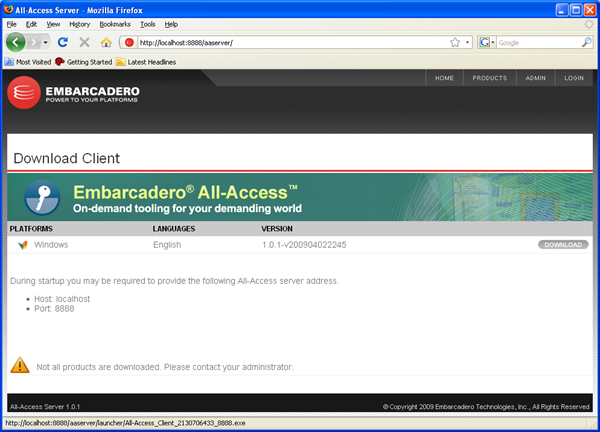 Embarcadero All-Access Server enables users at your site to download the All-Access Client. 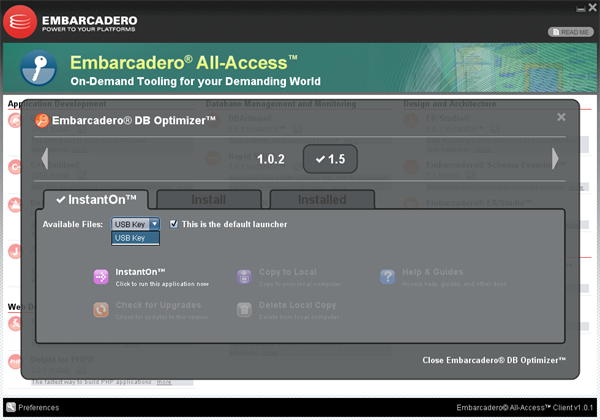 Subsequently, users can then download and use Embarcadero products from the client’s interface. All-Access Server provides the interface from which to administrate, manage, and distribute these products among users. This includes downloading updates and patches for products to the Server repository, and managing licenses. All-Access server is a central place for managing all users and their access to all tools. With Embarcadero network licensing, verifying compliance is as simple as logging into the license server, and seeing how many licenses are installed! 1. Make sure you have received All-Access Pass Code from the Embarcadero representative or partner. 2. 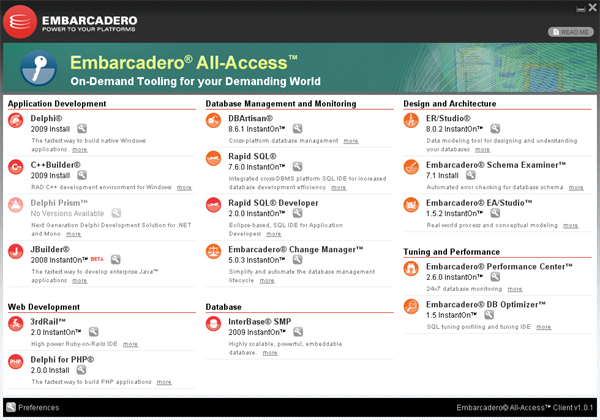 You need to have an Embarcadero Developer Network Account. If you do not have one, go to the http://edn.embarcadero.com to create your free EDN account. 3. Register your All-Access Pass Code at https://members.embarcadero.com/all_access. A list of eligible products will appear. Start with the All-Access Client. 4. 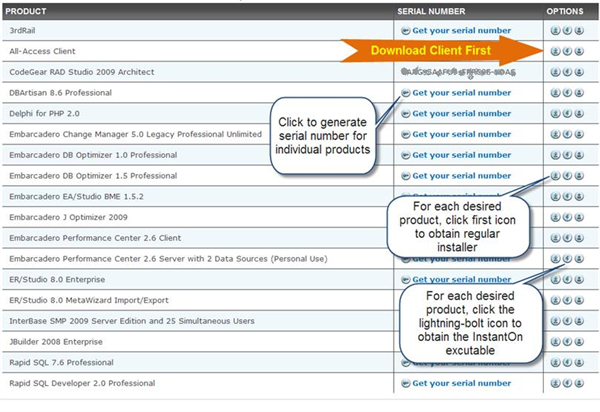 Each product must be licensed before it can be used, so you need to generate a serial number for the desired product, by selecting the appropriate product and serial # on the Embarcadero All-Access page. 5. 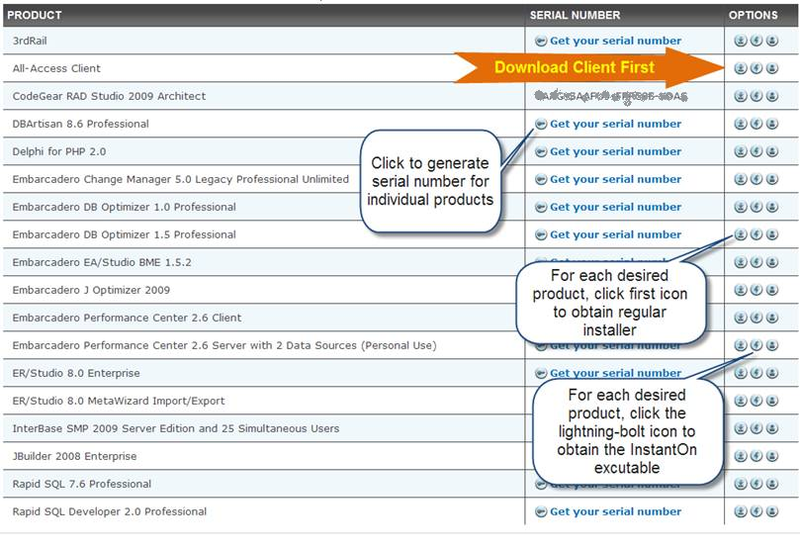 Once the product has been installed, enter the serial number and the EDN credentials to complete the one-time activation (once per product). 6. Products can be obtained in one of two ways. They can be either downloaded from the web site (if you want to do a regular install) or downloaded through the All-Access client. It will download the InstantOn version (if available) by default. All-Access greatly simplifies purchasing and license administration, eliminating the need to procure & budget for standalone products. All-Access is a tool chest with all the tools you need to quickly & effectively design, build, and run your software and database applications. InstantOn deployment reduces costs by eliminating the install step!